What do you do if you plan to connect your new amplifier without RCA connections? 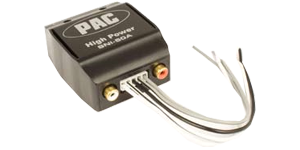 This is where a line level converter comes into play, it creates an RCA signal that can then be picked up by your amplifier. We have both direct connect factory radio and universal level converters available. Both versions "grab" audio signal by tapping into your car speaker wire.